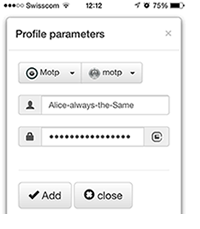 In the classic implementation of MOTP two-factor authentication the secret hashes used to produce one-time passwords are generated on the mobile application during the first initialization. This is rather inconvenient as the hash needs to be entered manually on the server. Token2 has agreed with the creators of MOTP to introduce a new procedure of initialization of OTP clients: similar to TOTP based systems, the hash can now be generated on the server side and be presented to the clients in the format of a QR code. // Make a new array with all available HEX options. For backward compatibility, Token2 Mobile OTP supports client-side hash generation : by touching the little icon next to hash field will generate and show the secret key immediately, so the application can be used as a standard MOTP client. This application generates OTP using Token2's proprietary algorithm, but is not limited to it only, additionally, it supports TOTP and MOTP as well, so you can use the same application for other sites requiring two-factor authentication; e.g. wherever you see a requirement to use Google authenticator, feel free to use our app as it is even more secure due to additional layer of protection with a PIN code .